JetBlue Airways enjoys a unit revenue premium compared to rest of industry, will investors beckon? JetBlue Airways’ passenger unit revenue performance has run counter to the US industry throughout 2015, reflected in its 1.4% increase in 2Q2015 and a 2.9% rise in 1H2015. JetBlue is posting gains as most other US airlines are recording drops that, in some cases, are reaching the mid to high single digits. JetBlue’s ability to post unit revenue growth is driven by the structure of its network. The airline’s points of strength are largely outside of the US domestic regions that are experiencing the strongest pricing dilution. All six of its focus cities posted margin expansion in 2Q2015. It is not clear how long JetBlue’s favourable network positioning will sustain growing unit revenues, but for now the airline is continuing to reap the benefits of recording unit revenue premiums over the rest of the US industry. The drivers of JetBlue’s unit revenue out-performance compared with other US airlines include its limited exposure to global markets where the USD is appreciating against other currencies, a certain level of network maturity and being shielded from the markets where pricing pressure is more prevalent. It appears that Dallas and Chicago are the two domestic markets where pricing dilution is most intense. Fares have dropped significantly in Dallas, where Southwest is undertaking a massive expansion from Love Field. Other airlines serving the Dallas market are feeling the effects including American, which has its largest hub at Dallas/Fort Worth. But Delta and United are also feeling the effects of a lack of pricing traction in Dallas, and United has also cited pricing pressure in Chicago. It has a hub a Chicago O’Hare (alongside American) and Southwest is the largest airline at Chicago Midway. JetBlue does not have a huge presence at either of those airports. It only serves its Boston focus city from Dallas and both New York JFK and Boston from Chicago O’Hare. Delta Air Lines recently highlighted some pricing pressure in JetBlue’s focus city in Orlando, but JetBlue EVP of commercial and planning Martin St George stated that the airline was pleased with Orlando’s performance. He remarked that JetBlue was not seeing any usual pockets of strength or weakness within the US domestic market. See related report: Delta Air Lines is not immune from soft domestic pricing. Will domestic capacity shrink? Can it? Mr St George stated that base on data from trade group Airlines For America, JetBlue’s unit revenue from its combined domestic and Latin American network outpaced the industry by nearly 7ppt in 2Q2015 on ASM growth that was 3ppt higher than the industry. JetBlue’s favourable network position in the current US industry operating environment is anchored by its six focus cities – New York JFK, Boston, Fort Lauderdale, Orlando, San Juan and Long Beach. JetBlue is either the leader or second largest airline at those airports based on ASM deployment. Those markets are largely outside of the pricing pressure points within the US domestic market. Although JetBlue’s new Mint premium product deployed on highly contested New York transcontinental routes has been a market disruptor, Mr St George remarked that Mint routes only represented roughly 7% of JetBlue’s ASMs in 2Q2015. JetBlue’s network shield against some of the weaker domestic regions helped to drive PRASM strength across both its domestic and Latin American and Caribbean networks, said Mr St George. The bulk of JetBlue’s international seats and ASMs are deployed into the Caribbean. 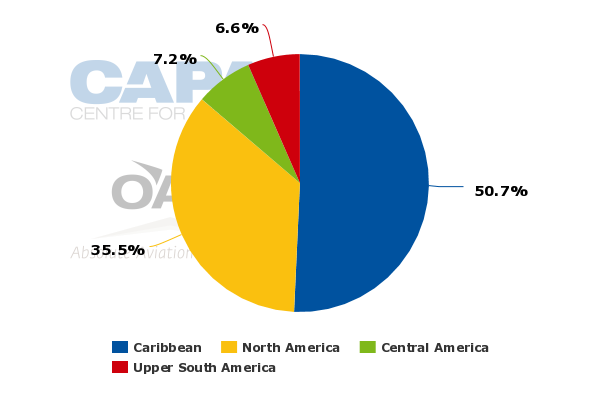 It serves numerous markets in the region, and is the largest airline between the US and the Dominican Republic, holding a 32% seat share for the week of 27-Jul-2015. JetBlue’s other destinations in the Caribbean include Jamaica, Grand Cayman, Port Au Prince, Aruba, Port of Spain, St Lucia, Barbados, St Maarten, St Croix, St Thomas, Nassau and Turks and Caicos. In addition to having a focus city in San Juan, JetBlue also operates to Aguadilla and Ponce, Puerto Rico. 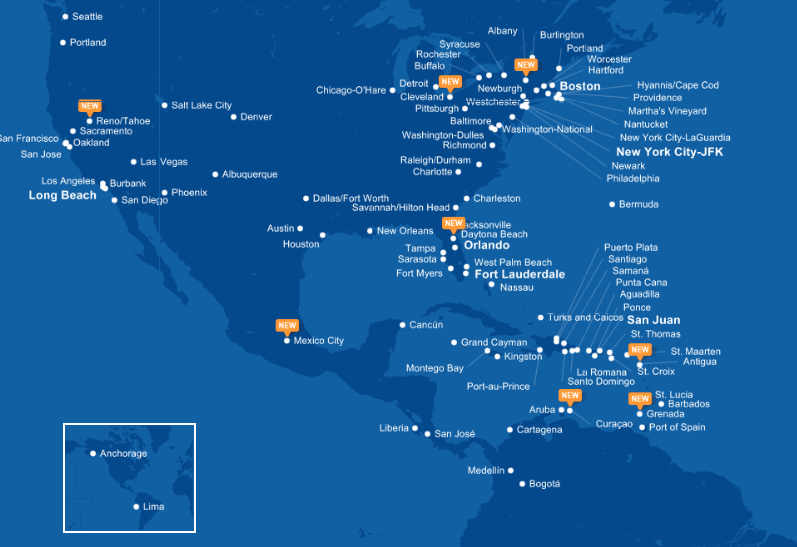 During 2015/2016 JetBlue is adding new flights from JFK to Curacao, Antigua and Grenada. It also plans to add a second destination in Mexico, when new service from Orlando and Fort Lauderdale to Mexico City starts in 4Q2015. JetBlue also serves Cancun from those two cities as well as Boston and JFK. JetBlue also operates to Central and Latin America, serving Liberia and San Jose in Costa Rica, Lima in Peru and Cartagena, Bogota and Medellin in Colombia. As the US domestic environment has grown weaker in some regions, softness in some areas of Latin Americas has improved. “If you go back twelve months ago...we would have been talking about challenges in Latin America with the capacity that JetBlue and others have added. "I think we’ve annualised some of that capacity and some of the capacity has come out from our competitors, and we’ve got extremely strong revenue performance in Latin America,” Mr St George concluded. 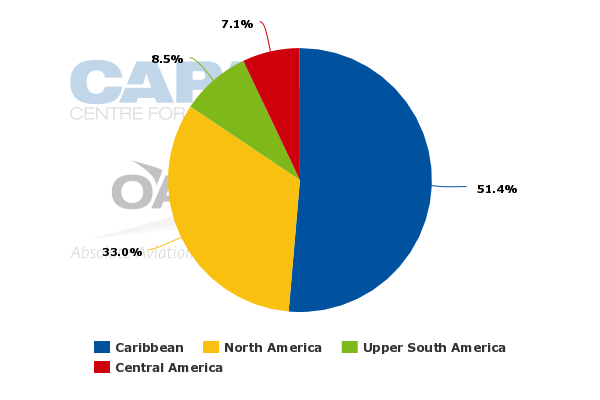 During 3Q2014 JetBlue highlighted that yields to both the Caribbean and Latin America were pressured by additional capacity both from JetBlue and its competitors, so the upcoming 3Q2015 comparisons should be more favourable for the airline. JetBlue does not serve the countries in Latin America with weaker economies such as Brazil, Venezuela or Argentina. Colombia’s GDP is projected to grow 3.4% in 2015, Costa Rica’s growth is projected at 3.8% and Peru’s GDP is estimated to grow 3.8%. By contrast, Brazil’s GDP is forecast to contract 1%, Argentina’s is estimated to drop 0.3% and Venezuela’s GDP is expected to contract 7%. By serving countries with healthier economies, JetBlue has inherent revenue advantage with its ability to tap the visiting, friends and relatives (VFR) passenger segment that comprises a large portion of its passenger mix. Unlike its US peers, JetBlue opts not to issue quarterly unit revenue forecast. But the airline expects Jul-2015 PRASM to be flat to up to 2%. The company also stated it expected softer revenue in the last week of Aug-2015 due to the US Labour Day holiday, but that it should benefit from the holiday’s timing in Sep-2015. High completion factors and the expansion of Mint service from New York JFK to Los Angeles and San Francisco in Oct-2015 have resulted in JetBlue guiding to the high end of its previously stated 7% to 9% capacity growth in 2015. After United opted to end its premium P.S. service from JFK and transfer the flights and expand premium service from its Newark hub, JetBlue quickly announced it was expanding daily JFK-San Francisco Mint flights from four to six and offer 10 daily Mint flights from JFK to Los Angeles by Feb-2016. JetBlue has the solid upside potential; now, will investors take notice? JetBlue’s unit revenue performance, along with the 2Q2015 debut of its fare segments and a seat densification programme for its Airbus A320s set to begin in 2016 provide a lot of upside for an airline that over the course of the last two years has received pushback from Wall Street as investors attempted to understand the passenger “sweet spot” the airline was targeting. Some of that pushback has faded with a leadership change and the planned seat densification project. 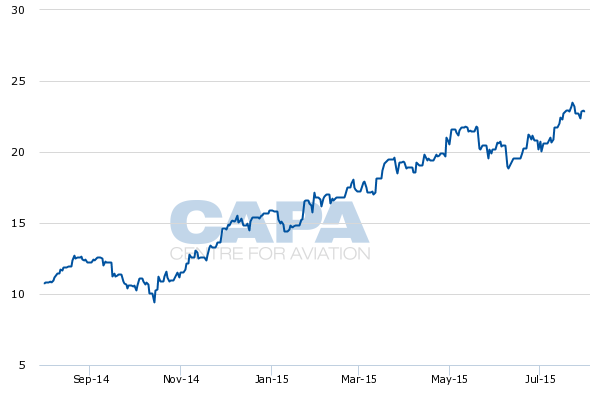 The market seems to be taking notice as JetBlue’s stock price has roughly doubled in a year to USD22.86 as of 30-Jul-2015. There is no doubt that its unit revenue performance compared with its peers will draw some investor interest as the unit revenue degradation the rest of the industry is experiencing appears to be hovering until 2H2016. It is not clear how long JetBlue will outperform; but for now investors may take comfort in its ability to sustain profitability and grow unit revenues.